Latest Update to this page: September 15th, 2011. Richard Garfield is on the design team? Alright... you've got my attention. For the few that may not know: Richard Garfield is the creator of Magic the Gathering and the last set that he was on the design team for was Ravnica. This is serious business. So what is Innistrad all about? Thanks to the artwork above, we know that Liliana Vess is definitely involved in some shape or form and that she's still holding onto the Chain Veil (a powerful magic item). We also know that the tagline is: "Horror Lurks Within" which definitely previews the atmosphere of the set. Sounds like peachy Unicorns and rainbows. Nothing is more horrifying. Am I right? Vampires in Black are nothing new but Red vampires are around on Innistrad due to their bloodlust (as MaRo said, "and nobody does lust like Red"). Red vampires have the "Slith" mechanic of gaining +1/+1 counters from connecting with a player's face. 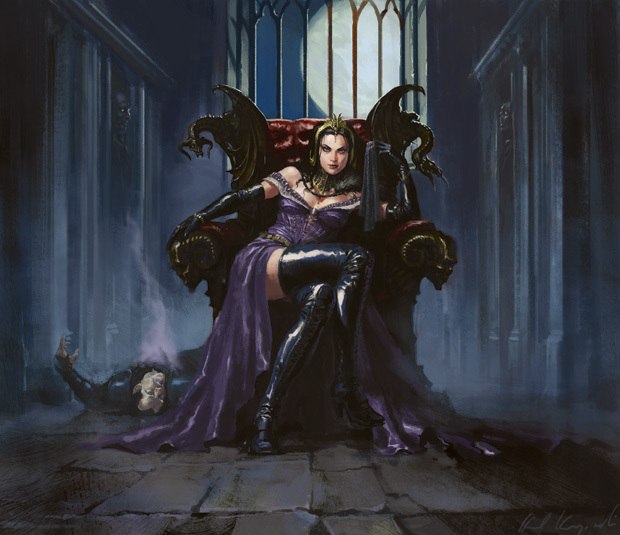 The vampires of Innistrad are predominantly members of royalty. There are different bloodlines including the Markov family (as in, Sorin Markov, and yes it has been announced that Innistrad is Sorin's home plane). Zombies in Black are well known while Zombies in Blue have a new identity. Blue zombies are made in the lab and are known for being a bit sturdier but requiring more resources to be played such as exiling creature cards from the graveyard. Many of the Black zombies in Innistrad come into play tapped to signify them being slow and/or are represented as waves of token armies (much like in a proper zombie apocalypse). Bestial creatures that represent rage? Yep, that sounds Green and Red to me. Werewolves get to show off the transform mechanic more than any other race on Innistrad. They're pretty much everything you'd expect werewolves to be and I sadly don't have much else to say beyond that. Vicious spirits reside in Blue while Casper the friendly ghost and others just like him exist in White (to go along with the theme that White is separate from the other colors in this block). Spirits also technically bleed into every color, much like humans. Beyond the simple concept of flying, Spirits also play around with the idea of humans dieing and becoming spirits. The humans play a vital role in Innistrad. They're the victims and slayers of the monsters. They're generally in White which was designed to be the color isolated from the others but they also branch out into every other color of the color pie with their secondary color being Green to keep up with the allied color theme of the set. Humans are designed to work well in numbers and use tools like a boss. There are several equipment cards that gain extra bonuses if wielded by a human. What cards have been previewed? Arcana #666? Coincidence? I think not. This is Kylak signing out and hoping for a hint of Lovecraftian horror. Cthulhu agrees.